Hello there and welcome back to my favorite series on Just A Simple Home! I have the honor of sharing posts from women who have inspired me in the hopes of giving you all some inspiration to start a new week. To me, this is what blogging is about- the community, the friendships, the building up of each other. 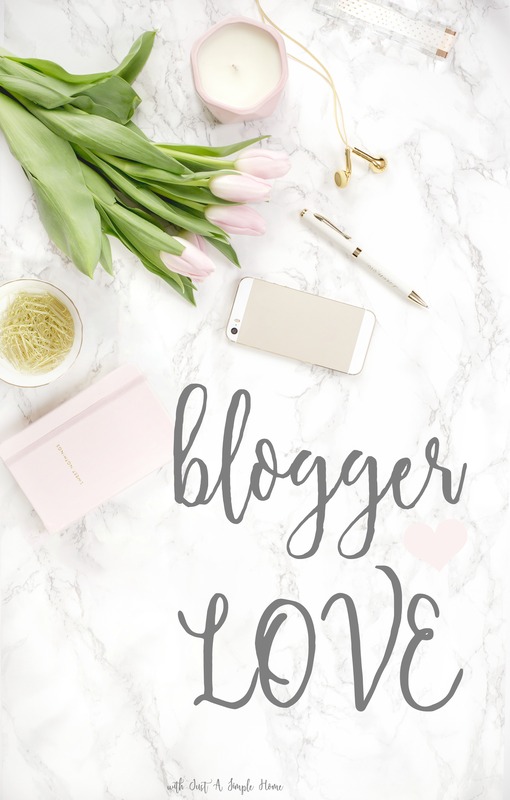 I have noticed more and more blogger friends are sharing the blogger love as well lately and I couldn’t be happier. As always, you may notice a theme. It’s funny…I don’t intentionally theme these posts, but it seems to naturally happen. I suppose you can tell what kind of mood I have been in during the week based on what I share. This week you’ll notice that these lovely women all have a heart to help others be better, do better, and live better. They are all honest and raw and inspiring. I hope you are blessed as much as I was. Ooooh, this one struck a chord deep down with me. Jillian is the blogger at OatmealHeart.com and this is a guest post she did that immediately had me hooked. I am so guilty of this. As a mom to 6 children, I am well aware of the stigmas I face. I think I need to do it all, have it all together, never struggle in front of people. But, how wrong I am. Jillian reminds us why we need to ask for help and what beauty will come of it when we do. Need a smile on your face? Amanda is a sweet friend of mine and I just love reading her words. This post had me nodding, laughing, and then then seeking to find my inner awesome. It gets to the heart an an issue so many women struggle with – self confidence and assurance – but in such a refreshing way. I only recently came across Sarah’s blog, but I was instantly drawn to her. She writes about her messy journey to a more faithful, healthy life for her family. This post struck me because I am often at odds with the Martha and Mary story in the Bible. I know I am supposed to be more like Mary, but I am undoubtedly more of a Martha. Sarah gets to the heart of the struggle. She acknowledges the need to get a handle on our Martha before we can become like Mary, and then to let God do the rest. I was so encouraged by her words and I have a feeling you will be as well. I LOVE finding new amazing blogs! Thanks for sharing! You too Amanda! xoxo Thanks for letting me share! This is a great blog post idea. I struggle to write on any sort of consistent basis so I would never do a series, but I should write about my favorite bloggers some time. You should, Crystal! I think it’s a lot of fun and it has led to some great friendships. These sound great, so I’m off to read! These are great blogs to follow! Thanks for sharing. This is such a great idea for a post and an awesome way to spread the love! So cool! Thanks for sharing, always good to find some new good reads :)! This is a great round up! I can’t wait to read them all. These all sound like some really inspirational posts. I haven’t read any of these blogs yet, but I’m so excited to learn more now. Thanks for sharing these awesome posts — I’ll definitely try to check them out! Love this post! It’s so nice when I find a new blogger I can relate too! Thanks for sharing! Great posts! I love the guest one from Jillian. Thank you so much for sharing! Thanks for sharing other blog posts! I love finding new ones to read and it’s wonderful to see so much support for each other in the blogging community! I always love reading your blogger love posts. Often times I see a post that you recommended that just speaks to me. Like Amanda’s post which reminded me that it is all about your perspective. Thank you for constantly inspiring me! I can’t wait to check these ladies out! They sound like very sweet bloggers! These sound wonderful! I cannot wait to read them! The I Am Awesome sounds like something I need to read! Thank you for sharing!